Check out if KickStart is in The Top 100 NGOs 2013 Edition! Changing the way the world fights poverty. Eighty percent of the poor in Africa are small-scale farmers, dependent on unreliable rain to grow their crops in anticipation of two harvests per year. Realizing that irrigation was the most effective way to leverage this population’s two valuable assets – a smallplot of land and basic farming skills – in order to support a move from subsistence farming to commercial agriculture, the founders of KickStart set about a devising a model that would bring together the transformative power of technology, the entrepreneurial spirit of the impoverished, and the sustainability of the marketplace and private sector. 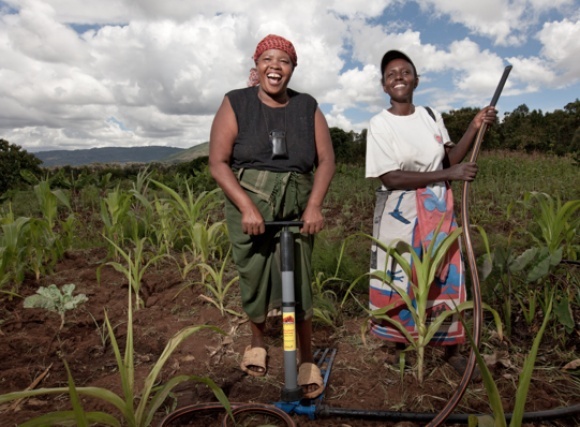 In 1998, KickStart developed a line of manually operated ‘MoneyMaker Pumps’ that allow farmers to easily pull water from a river, pond or shallow well, pressurize it through a hose pipe and irrigate up to two acres of land. By 2011, the organization estimates that the sale of approximately 185,000 low-cost pumps in Kenya, Tanzania and Mali has led to over 600,000 people lifting themselves out of poverty. Operating as a non-profit but aiming to build a self-sustaining business model, KickStart works with factories, shippers, distributors and dealers to set up and strengthen local supply chains with the goal of leaving in place an active and sustainable market once marketing subsidies are withdrawn.